The Irwin HSS Pro TiN drill bits are primarily designed for drilling metal and harder, tougher alloys. 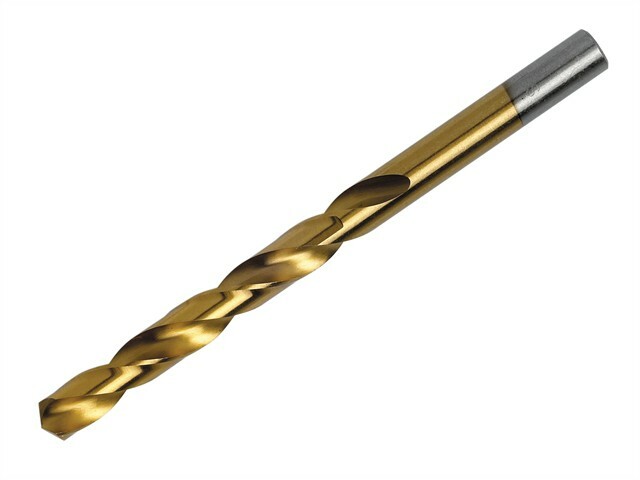 Compared to traditional HSS twist drill bits, speed can be increased by 40 -60% and feed by 10 -20% without reducing the life time of the drill bit significantly. TiN is also a poor conductor of heat, so the heat generated during the drilling process is diverted into the chips and coolant and less into the drill bit. These drills have a 135° split point grinding tip which ensures perfect centring and reduced drilling pressure. The drill bit body is manufactured from high quality HSS steel coated with 2.5µ Titanium Nitride (TiN), the TiN coating has a hardness of app. 80 HRC and is very resistant to wear. TiN has a low coefficient of friction, this results in less power being consumed and less heat generated during the drilling.